Club: St. Brendans LGFC County: Galway Position: Centre Forward / Centre Back Occupation: Student Ladies Gaelic Football Achievements: At club level: various underage county titles, 1 junior county title, 1 senior Connaught league, 1 senior Connaught championship, 1 U-14 Feile A All Ireland title. 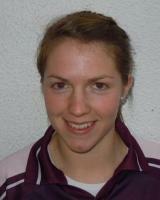 With Galway: 2 Minor All Ireland Titles, 1 U-16 All Ireland title, 1 U-14, 2 U-16, 3 Minor Connaught titles. With School: 1 Senior B Schools All Ireland title, 1 Junior B Schools All Ireland title, 1 Junior C Schools Connaught title. Toughest opponent: Niamh Fahy Galway When did you start playing Ladies Gaelic: When I was 8 years old in National School High point of your career to date: Winning the 2005 Minor All Ireland with Galway Biggest Disappointment: Losing the Senior Club All Ireland Semi Final 2005. Favourite Player: Female: Una Carroll Galway Male: Colm Cooper Kerry Most embarrassing moment on or off the football field: Too many to mention!! Favourite Food: Mushrooms Nickname: Wardy Favourite Ground: Semple Stadium Favourite Ladies Gaelic Football Skill: Handpass Person you would most like to meet: Graham Norton One rule you would change in our game: Iâ€™d get rid of the sin bin. Influences on your career: Tomas Heavey my National School principal got me started playing football. Con Moynihan founded our club and trained us for years leading us to many successes. My father has always been very supportive and is there to give me advice.